Upon seeing the title for this recipe, many people may think, “Eew. Black beans in dessert? No, thank you!” But, if you didn’t know the brownies had beans in them, you would probably really enjoy this delicious treat and may even ask for the recipe. 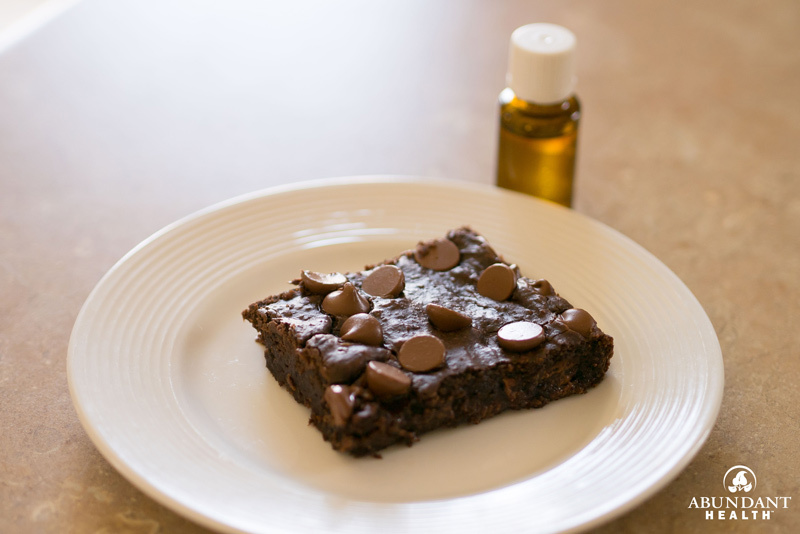 Sure, they are healthy and may not taste as sweet as traditional brownies, but adding peppermint essential oil definitely makes them quite appealing! Go ahead—give them a try. You probably won’t regret it. Preheat oven to 350 degrees F. Grease a 9×9 or 8×8 pan. In a blender or food processor, blend the quick oats until they reach a fine consistency. Add the black beans, and blend until smooth. Add the rest of the ingredients, except the chocolate chips. Blend until smooth. Stir in the chocolate chips, and pour the batter into the prepared cooking pan. Sprinkle extra chocolate chips over the top, if desired. Cook the brownies for about 30 minutes. Brownies are done when a toothpick inserted in the middle comes out clean. Allow to cool at least 10 minutes before cutting. I love these brownies – they’re one of my favorite GF recipes! I make them often & give them to my daughter as a healthy snack. I have changed the recipe a bit by adding 1/4 c. of coconut yogurt which makes them fluffier & moister, and 1/2 c. of coconut just because I love coconut. I also up the cocoa and vanilla slightly to counter the tartness of the yogurt. Morbid curiosity drove me to make these. Black beans and chocolate…wait, what? But I am so glad I did! These are amazing and you do not taste the beans. Peppermint in them is awesome! My new brownie recipe for sure. As a vegan, I love it when my protein sneaks in from places not even imaginable! Just made these…entire family loved them. I don’t even taste the beans. Easy to make and taste delicious. Especially love the peppermint touch.